Here's a log flume used by the Oregon Logging Company to get logs from Chenowith to Viento about 1900. Imagine the work to build or maintain such a structure. Look closely, you can see bigfoot in the timbers! Sometimes he rides the flume for fun!! I don't see how this spindly thing could last for more than a week. One log or tree or snow melt coming down the river would wipe out half of it. Wasn't there one of those across the Hood River? I could see them being torn out by floods every few years, or burning down easily. I assume this is above the fish hatchery, but it actually could be in that curve right below the hatchery. appears to be a wire running along poles on top of the flume, phone? What an engineering nightmare. That spindly thing would have caught every twig that floated down the river and must have acted as a dam during even minor flooding. A single tree of any size moving down the river would have acted as a battering ram and taken the whole thing out. A lot of this kind of structure didn't make it through a year of use before failing. Constructing and repairing the thing must have been dangerous as heck as well. Yes and they used to also build bridges like this and actual trains went over them. Back east they had a bunch of these during the Civil War. They must have had damage early on from high water to put though's guard panel in place at the water level. 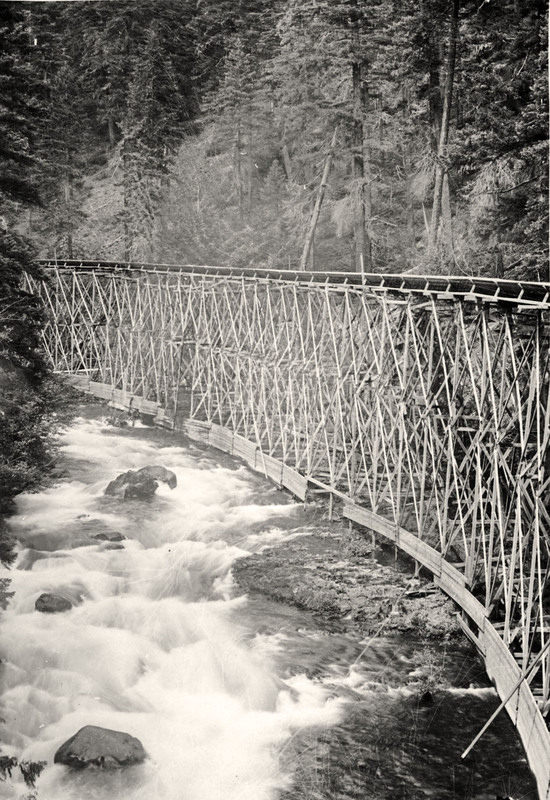 Is this be the high flume trestle at Spirit Falls?